Illinois is in serious fiscal trouble. Unpaid bills will hit about $10.5 billion later this year, counting unpaid lotto winners and state university bills. Lotto is a small problem overall, yet symbolic of the mess the state is in. Because Illinois has no current budget, the state does not pay lotto winners. Instead it sends the winners IOUs. Yesterday, two Illinois lottery winners filed a class action lawsuit over unpaid prizes. Unpaid bills do not count additional promises that politicians seek. For example, Chicago Mayor Rahm Emanuel wants a half billion dollars from the state to shore up the Chicago school budget. Where is that supposed to come from? The list of "wants" is endless; the reality is "Illinois is flat out broke". When will multiple downgrades from Moody's, Fitch, and the S&P hit the overall state, not just the city of Chicago? In a big understatement of Illinois' problem, a Crain's Chicago headline reads Illinois IOUs Growing Fast, Could Pass $8.5 Billion by Yearend. 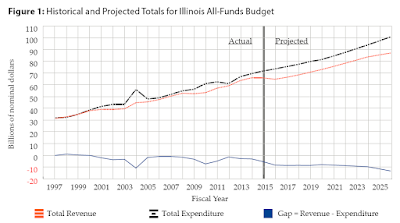 Slowly but surely, Illinois government is beginning to drown in red ink, State Comptroller Leslie Munger said today, as the cost of the continuing Springfield budget war steadily worsens the already bad condition of state finances. Without legislative action to adopt a balanced budget, the state's backlog of unpaid bills will hit $8.5 billion in December—not counting an additional $4 billion in spending for state universities, lottery winners and other purposes that has been indefinitely deferred, Munger said. If the bill backlog indeed hits $8.5 billion in December—and you include half of that $4 billion in other spending, since December is the midpoint of the state's fiscal year—that would put the cumulative backlog at what appears to be an all-time high of $10.5 billion. As best as I can tell from consulting with state finance insiders, the highest the backlog ever reached in non-inflation-adjusted dollars was in 2010, early in the days of the Pat Quinn administration, when it hit $9.9 billion. My favorite comment to Crain's article comes from "Earl" who sarcastically asks "Why not try not spending money the state does not have?" Indeed. Let's try that. Well, actually Illinois has been doing that for years. And bad as $10.5 billion sounds, it's but a small drop in the cumulative bucket. Drum roll please: In January, Illinois' total cumulative liability was $159 billion. Counting $4 billion in spending for state universities, lottery winners, etc., the total cumulative liability is on the order of $163 billion today, and growing more rapidly than ever. 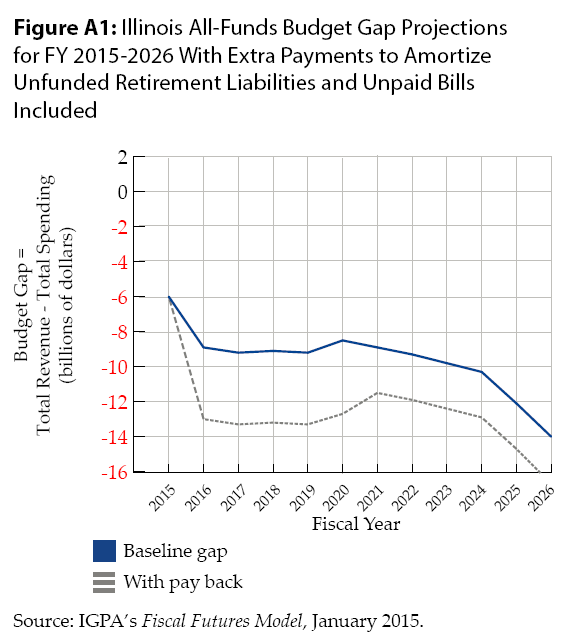 A study released this past January called "Apocalypse Now" discusses the "Consequences of Pay-Later Budgeting in Illinois". The stack of IOUs. The term “legacy costs” is sometimes used to describe obligations to pay for services purchased by the state in previous years. Pension obligation bonds. Illinois issued bonds in FY 2003, 2010 and 2011 to cover scheduled contributions to its pension funds. At the end of FY 2015, the remaining principal on these bonds will be $12.7 billion. Unfunded liabilities for pensions. 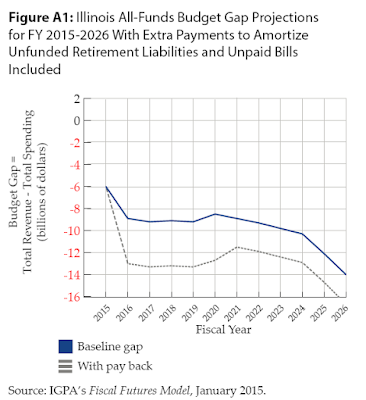 As of the end of FY 2014, the state of Illinois’ five retirement systems had assets to cover only 42.9 percent of liabilities, leaving an unfunded liability of $104.6 billion. Unfunded liabilities for retiree health costs. As of the end of FY 2013, the state had unfunded liabilities for retiree health costs of $34.5 billion. Short-term inter-fund borrowing in FY 2015. Authorizing legislation for FY 2015 permits the General Funds to borrow $650 million from other funds to be paid back within 18 months. Unpaid bills. As of December 2014, unpaid bills for services already provided to the state totaled $6.5 billion. The total value of these obligations to pay for past deficits is $159 billion. Figure 2 shows a projected deficit of $9 billion for FY 2016 to 2022. Illinois is projected to have total sustainable revenue in FY 2016 of $65 billion, but a much smaller amount represents state-controlled revenue. If we eliminate federal grants, health provider fees (linked to Medicaid spending), and the portion of sales, income, and other taxes transferred back to local governments, the state’s own share of total revenue in FY 2016 is only $36.3 billion. The $9 billion deficit represents 25 percent of that revenue. Raising all of Illinois’ taxes and fees by 25 percent would be extremely difficult politically. Pay-later budgeting has been perpetuated by a political willingness to ignore the fact that every dollar borrowed to pay the bills in one year must be paid back with interest, thus crowding out what the state can spend on other priorities in future years. 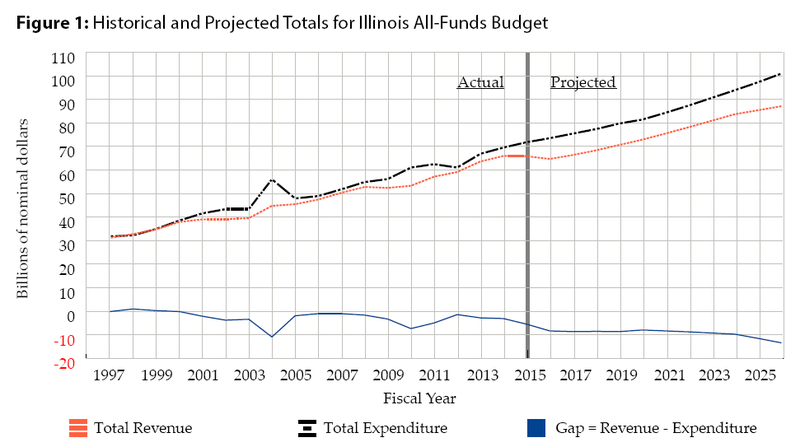 Illinois’ fiscal problems are huge, structural, and escalating quickly. The state’s deficits cannot be eliminated by quick, temporary fixes, or by waiting for the economy to grow. Digging out of our accumulated fiscal problems also requires changes in awareness and expectations. Being saddled with paying off IOUs for past years’ bills means that Illinois’ citizens must reduce their expectations for the services that they can expect from government and be prepared to pay more for government now and in the future. Decision makers need to understand — and act on — the fact that pay-later financing hurts the state’s residents and businesses in future years. Some of the legacy costs detailed above have pay-off schedules and are included in the deficit projections, but others do not. The lack of a pay-off schedule can conceal but does not change the fact that legacy liabilities will crowd out other spending. In order to illustrate the magnitude of those “hidden” effects of past deficits, we use the Fiscal Futures Model to simulate of effects of specified pay-off schedules for the “hidden” liabilities. Figure A1 shows the result of adding these three payment schedules to the Fiscal Futures Model. The US Census Bureau reports the Illinois population is on the order of 13 million and growing slowly if at all. The accumulated bill amounts to $12,538 per every man, woman, and child. But children don't pay bills or taxes. So let's do the calculation based on the census estimate of 4,772,723 households. That accumulated bill amounts to $34,152 per household. 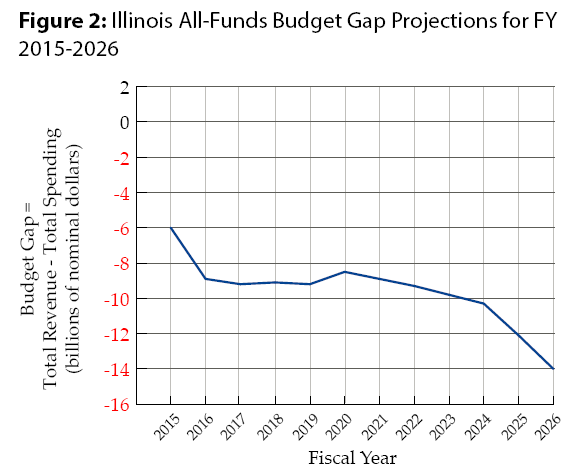 I propose the Apocalypse Now study hugely understates Illinois problems. Bond downgrades and higher borrowing costs? Possibility of a significant stock market decline? I discussed point eight in detail on July 21 in SuperBull Club: RBC Ups Morgan Stanley, Says Bull Market to Continue 6 Years; Sobering Alternative View from GMO. 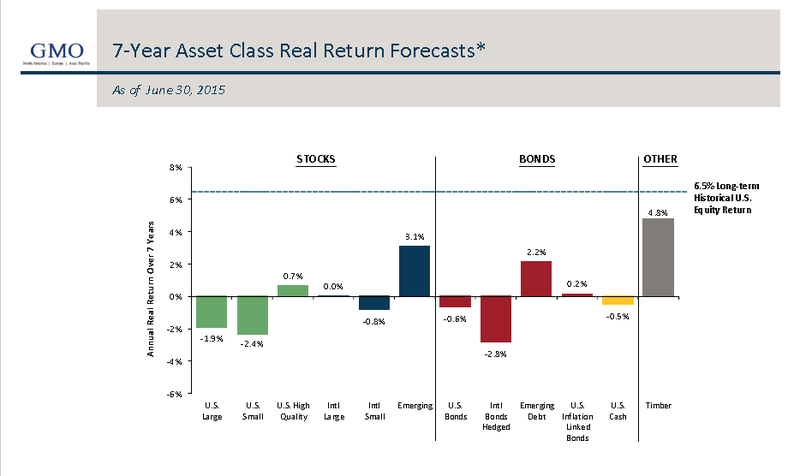 In contrast, to the SuperBulls, I present the 7-Year Real Return Forecast of GMO. 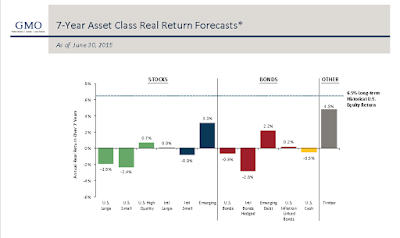 *The chart represents real return forecasts for several asset classes and not for any GMO fund or strategy. These forecasts are forward‐looking statements based upon the reasonable beliefs of GMO and are not a guarantee of future performance. Forward‐looking statements speak only as of the date they are made, and GMO assumes no duty to and does not undertake to update forward‐looking statements. Forward‐looking statements are subject to numerous assumptions, risks, and uncertainties, which change over time. Actual results may differ materially from those anticipated in forward-looking statements. U.S. inflation is assumed to mean revert to long‐term inflation of 2.2% over 15 years. Note that GMO expects negative real returns in US stocks, on average, for a full seven years. I hate to ruin a SuperBull party with forecasts that have been historically among the best in the world, but so be it. Tax hikes are not the answer. Tax hikes will just cause more Illinois taxpayers and businesses to flee. Business exodus is already a serious problem. For details, please see Get Me the Hell Out of Here. Massive reforms are the only thing that can possibly save this state. Meanwhile, Debt downgrades from Moody's, Fitch, and the S&P are just around the bend, and deservedly so.